Visitors touring house will see the paintings, sculpture and furnishings that Frederic and Isabel Church acquired and that surrounded them and their children, servants and guests in their daily lives. The collection was described by a 19th-century visitor as “a museum of fine arts rich in bronzes, paintings, sculptures and antique and artistic specimens from all over the world.” Today’s visitor experience is remarkably unchanged; the interiors of the main house look as they did in the 1890s. This is the virtually intact home of one of America’s most important painters. The sheer richness and depth of the collections speak to the Churches’ life-long interest in acquiring intriguing objects from around the world. The whole is an outstanding example of an early Aesthetic Movement interior. Dozens of smaller but very finished sketches ornament the walls of the main house. These include images of the places Church traveled, such as “Olive Trees, Athens,” “Königssee, Germany” and “Mount Chimborazo.” Church also sketched Olana in all seasons. “The Hudson Valley in Winter From Olana” and “Apple Blossoms” are two of the oils on view that record the property. Like many artists, Frederic Church accumulated his own preparatory work, other artwork he admired or found useful, and even, it appears, artwork left by chance. Olana owns some 700 works by Church, executed in pencil, ink, oil and associated media. Olana also holds some 300 sketches by Church for architectural elements at Olana, and another several hundred stencils. Prints were made after many of Church’s paintings, and he was often an active participant in these commercial ventures. Olana has copies of 35 of these prints, ranging from different states of the five folio-sized prints after Church’s works, to small prints published as illustrations for books. Olana also holds ancillary objects related to Church’s career as an artist, such as the medal he won in the Paris Exposition of 1867 where he exhibited “Niagara Falls” (1857) and “Rainy Season in the Tropics” (1866). Many years after Church’s death, his son Louis, who had inherited Olana, donated some 2,000 sketches by Church to the Cooper Union Museum. These artworks can be viewed at the Cooper-Hewitt Museum, now part of the Smithsonian Institution. Frederic Church, and perhaps Isabel and their children, were also interested in photography. Olana has some 2,000 photographs dating from earliest commercially-produced prints to deluxe folio-sized prints from the turn of the century. Most photograph documents exotic locales and peoples. Highlights include scenes of Egypt by Francis Frith, South American and Mexican ruins by Désiré Charnay, and images issued by the Palestine Exploration Fund. Frederic Church was a friend of a Danish artist named Fritz Melbye. The two shared an interest in South America, where each had traveled, and they went to Jamaica together in 1865. Research has revealed that the peripatetic Melbye died on a trip to China in 1869 and he apparently left a cache of drawings with his friend Church. This collection consists of some 450 works, mainly by Melbye but it also includes several dozen by Camille Pissaro, a student and friend of Melybe. The two spent several years together in the 1850s in the Caribbean and Venezuela. Pissaro went on to live in France and become one of the founders of Impressionism. Thus Olana is the unlikely repository of important early drawings by a major French Impressionist artist! 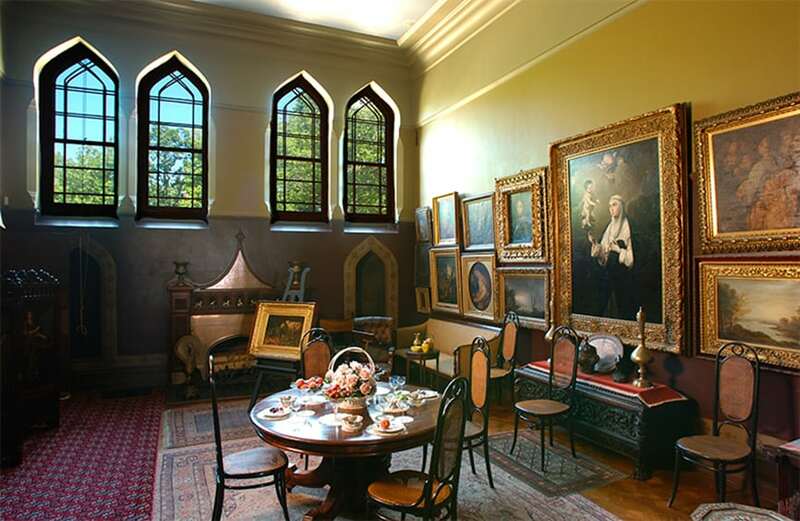 Much of the artwork at Olana was made by artists who were friends of Frederic and Isabel Church. Erastus Dow Palmer is represented by series of bas-reliefs, and a full-length statue of a youth entitled “Sleep,” all on view in Court Hall. A major canvas by Thomas Cole, “Protestant Burying Ground, Rome Cemetery in Rome,” hangs in the Sitting Room. 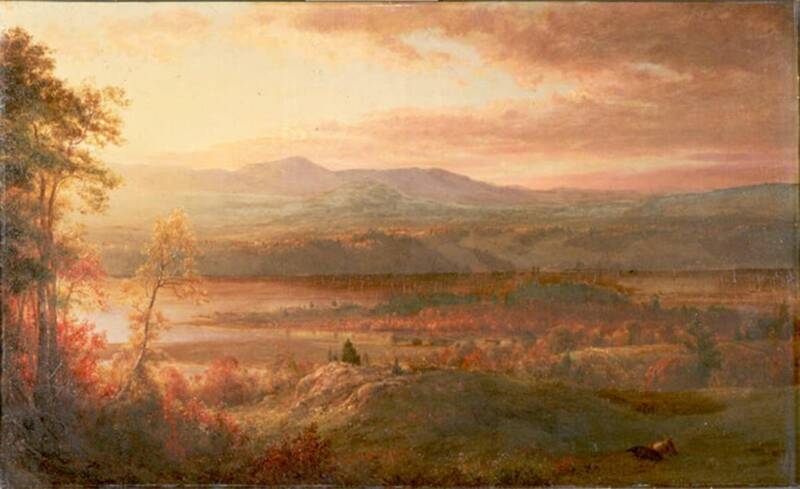 Arthur Parton’s view of the landscape at Olana before it was improved by Frederic Church hangs in the East Parlor. 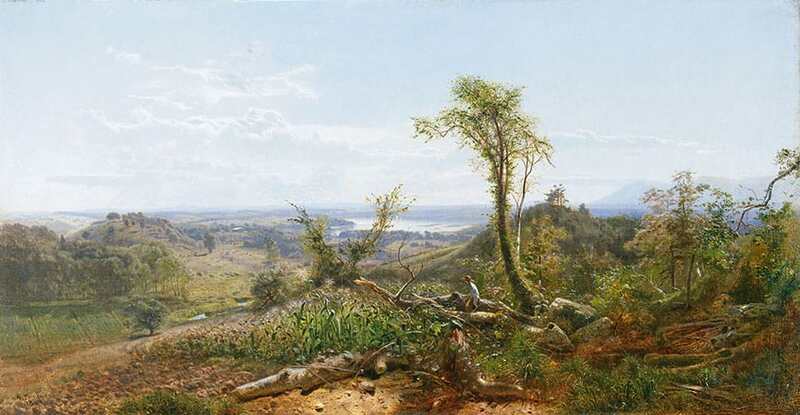 “Arthur Parton, Looking Southwest over Church’s Farm from the Sienghenburgh”, 1864, oil on canvas, 19 ¾ x 31 1/8 in. Collection Olana State Historic Site. The fruits of Frederic and Isabel Church’s predilection for collecting are in evidence throughout the house. There are dozens of carpets from all regions of the Middle East; two tile fireplaces by Ali Mohammed Isfahani, a 19th-century Persian ceramist, purchased through a shop in New York City; the family’s original library, its household china, and a collection of sombreros and Mexican folk art. While in Rome in the winter of 1868-9, Frederic Church haunted the antique stores and bought old master paintings, and these formed the nucleus of the collection that now hangs in the high-ceilinged Dining Room. On his many trips to Mexico, Church visited the ruins of Pre-Columbian civilizations. He had the opportunity to buy artifacts there, and from friends who also had ties to Mexico and Central America. Olana’s Pre-Columbian pieces are on view on the Studio. The collection of old master paintings is on view in the Dining Room. Photograph by Andy Wainwright.